Q: What is a solar electrical system? A: A solar electrical system is a clean, quiet, long-lasting generator with no moving parts that produces electricity from sunlight – even on cloudy days. It is also known as a “photovoltaic” or “PV” system (photo = light; voltaic = electric power). A PV system can virtually spin your electric meter backwards — giving you solar electricity during the day, sending up to the grid anything extra that you´ve produced (and are credited for), and effectively delivering it back at night when you need it — thanks to bi-directional (2-way) energy metering. Q: What are the different types of PV systems? A: There are 4 types of PV systems: Direct, off-grid with batteries, on-grid with batteries, and on-grid without batteries. 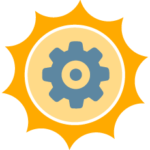 Direct PV is simply a solar panel connected to a DC device like a solar-powered attic fan that is not connected to your building wiring or the utility grid. The fan operates only when the sun shines. Off-grid PV with batteries is used to power millions of homes and electrical devices around the world that do not have utility power. Off-grid PV with batteries use special batteries designed to be charged and discharged for many years. The batteries in an off-grid PV system store energy to provide autonomous power at night and on cloudy days. On-grid PV with batteries operates similar to off-grid with batteries except that the battery stored energy is used to provide emergency power during grid power outages. Batteries and other parts increase PV system complexity and its cost by about 30% more than on-grid PV without batteries. On-grid PV system without batteries is the most popular (and practical) urban and suburban solar solution because of its much lower intial cost, virtually maintenance and trouble-free operation, and the fact that it offsets costly and polluting grid electricity. Q: What is the main difference between a PV system with and without batteries? A: The primary differences are cost and complexity. We are all concerned about power blackouts, but utility power is reliable in most urban and suburban areas so very few people need to take on the extra expense of a system with batteries. There are exceptions though, and if your utility power is unreliable you have 3 options. Southern View Energy can install a fossil- fueled generator in conjunction with your PV system for occasional emergency power outages. We can design and install an on-grid PV system with batteries for you that will power your “essential” electric loads (lights, refrigerator, communications, etc.) during a utility power outage. Or we can also design a separate battery and inverter system even without PV, that will provide you with uninterruptible power for special electric loads. Q: Will a PV system give me power during a grid power outage? A: Only PV systems designed with battery back-up can give you power during a grid power outage. PV systems without batteries turn off automatically during a grid power outage to prevent possible injury to workers repairing the power lines. When grid power is restored, the PV system turns back on automatically. Q: What happens with a PV system at night? A: When the sun goes down the inverter automatically switches to standby mode and you get electricity from the utility company. The next day when light strikes the solar array the inverter turns back on automatically, to provide you with PV-generated power. Q: What types of PV systems does Southern View Energy offer? A: We offer all types of PV systems, with and without batteries, for both on and off-grid applications. Q: Do PV systems cause any negative effects? A: No. A PV system has no moving parts, is extremely reliable and long-lasting, and requires practically no maintenance. Solar power works in conjunction with utility power and in no way adversely affects grid reliability or causes grid outages. On the contrary, PV actually improves grid stability and electricity quality. In addition, PV modules produce more energy than used to produce them which is good for the environment. PV modules are “net energy positive” in less than 4 years, whereas grid power made from coal, gas and nuclear materials consumes non-renewable resources and every kilowatt produced by these means pollutes the land, air and water. Q: Can a PV system produce sufficient power to run my air conditioning, refrigerators, pool pumps and other devices that use a lot of power? A: Yes, but PV is not usually used to directly power separate circuits for specific equipment. It is far more practical for the PV system to be connected to the main bus bar in your electric service panel to offset all power consumed. That way, there is no negative effect on equipment like motors that have large startup and operating current consumption. Q: How long will a PV system last? A: A well-designed and properly installed PV system can last for many decades. PV systems installed in the 1970s are still in operation. Since solar modules have a 20-30 year power output warranty (depending on the manufacturer), you can plan on at least 25 years of steady operation. With the first silicon solar cells made by Bell Laboratories in the 1950s still operational today, a 40-50 year lifespan expectation for today’s PV systems is not unreasonable. Q: How much roof area does a PV system require? A: The south-facing roof of most homes has enough space for a solar array that can produce anywhere from 20-100% of the energy used in a home. Each 100 square feet of solar array will produce about 1,500 watts of PV power and generate an average of 7 kilowatt-hours per day. And you are not limited by roof space alone: A PV array can also be placed on the ground. A: No. A grid-tied PV system does not require batteries. All excess power produced during the day is deposited into the grid, with the credits available to the owner later thanks to net metering. Q: Do PV systems work at night and on cloudy days? A: A PV system without batteries produces power from daylight. Full sun produces full power. On cloudy and even rainy days power is still produced, although at a reduced rate. Your PV system’s output is calculated based on area-specific climate data which takes into consideration changes in the weather. Q: What are the warranty periods? A: Today’s solar panels come with power production warranties that run from 20-30 years. Inverters have 10-25 year limited warranties. And Southern View Energy provides a 2-year specification, labor and workmanship warranty on all PV systems that it installs. A: Your on-grid batteryless PV system is virtually maintenance free. There are no moving parts and nothing to lubricate or adjust. Georgia’s usual regular rainfall keeps the solar array clean or you can rinse off dust and dirt with water from a hose. Off-grid battery systems and on-grid with battery back-up systems allso require no maintenance, but will benefit from having an annual inspection by a qualified solar technician to assure that the charge controller and batteries are being maintained in good working order. Q: Do I need a building permit for a PV system? A: Yes. All PV systems must have a building permit and electrical inspection. Southern View Energy is a licensed and insured electrical contractor, and is further NABCEP (North American Board of Certified Energy Practitioners) solar certified. Q: Can Homeowner Association (HOA) rules stop me from putting a PV system on my roof? A: Maybe. Unfortunately, Georgia is one of the few states left that does not have a Solar Rights Act that prohibits a homeowners’ association from restricting installation of PV systems. Q: Do I need approval from my homeowner’s association? A: Possibly. Consult your homeowners’ association covenants for details. In recent years many HOA’s have removed or substantially modified older restrictions that they had on solar installations. We can also provide support in the form of material photographs, drawings, and even samples of solar panels for board members or other homeowners to see. Q: How much experience does Southern View Energy have? Do you do your own work? A: Southern View Energy, Inc. is one of Georgia’s most experienced licensed photovoltaic contractors, with direct installation experience on over 2 megawatts (2,000,000 watts) of installed power in residential, commercial and municipal locations. Further, we are one of the very few to employ only our own trained professionals…we never subcontract out our work. And we stay current with all that is happening in the world of solar. Q: What is the process for getting a Southern View Energy PV system? A: Buying a PV system from Southern View Energy is easy. In order to provide you with an accurate quote for your custom solar electric system, we would need to review your most recent electric bills. Once we receive your basic information (site location, recent electric bill) we will contact you with a preliminary quote within 48-hours. If that sounds like it may work for you, we will then schedule an on-site assessment to confirm measurements, inspect the structure of your roof, review electrical components and determine panel tilt and azimuth. Contact us today, and we’ll help make your “going solar” simple! Q: What is net metering and how does it work with a PV system? A: Net metering is a special billing arrangement that provides credit to utility customers with PV systems for the avoided cost value of the electricity that their PV system generates. Your utility meter keeps track of how much electricity you consume and how much excess electricity your PV system generates that is sent back into the utility grid. You pay your utility only for the net amount of electricity used. 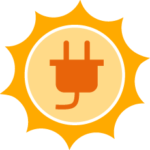 During the day, your PV system can produce more electricity than you use. The excess power automatically goes through the electric meter into the utility grid — effectively “spinning the meter backwards” as a credit to your account. The new digital meters electronically measure electric current flow in both directions. Excess solar production is typically carried over from one month to the next on an annual basis. 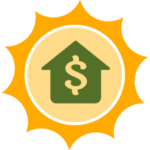 Net metering optimizes your solar investment rate of return and allows you to the ability to install a PV system of a size that can zero-out your annual electric bill. Q: How much money can a solar electrical system save me? A: A well-designed PV system such as Southern View Energy can provide will save from 20% up to 100% on your electric bill. Q: How does the solar tax credit work? A: Homeowners and businesses alike are eligible for the generous 30% U.S. Clean Energy Investment Tax Credit. This is taken on a simple 2-page form (IRS 5695) at tax time, and has a lifetime carryover provision. In other words, if for any reason you cannot realize your full tax credit amount in the first year it never expires — it carries over each year until you do. Q: Are there are additional solar incentives? A: Yes, several utilities throughout the state offer substantial rebates on solar electric and hot water installations. Southern View Energy stays current with each of them and can advise if your utility has one. Business owners with a commercial PV system also have the added benefit of accelerated, 5-year depreciation (with a bonus 50% able to be taken in the first year) that can turn their PV system into a profit center in very short order, with an excellent return on investment. And both residential and commercial PV system installations add considerable value to the property on which they are installed. Q: How do I get a quotation for a PV system for my home? A: Give Southern View Energy a call, or send us your name, address, phone number, email address and a copy of a recent electric bill and we will contact you with a preliminary quotation based on the aerial photo of your home or business and your electric consumption. Q: Who does all of the rebate and permit paperwork? A: Southern View Energy does all the paperwork from system design and engineering, to permit and inspections. We will also assist you with any rebate and utility interconnection applications.